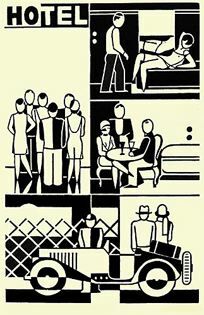 Gerd Arntz is one of the more unusual, if less well-known, artists of the Weimar Era. Like his more famous contemporaries George Grosz and John Heartfield, Arntz wanted to strip art of bourgeois preciousness. In order to efface all evidence of his individual hand, he invented a stylized vocabulary of symbolic forms. His predilection for the flat, black and white tonalities of woodblock further served to obliterate the artist's personal touch. Nevertheless, his incisive visual analyses of German society, corruption, and political factionalism can hardly be considered impersonal; even in stark black and white, Arntz's work reveals the artist's political predilections and idiosyncratic viewpoint. Although Arntz lived into his eighties, his best loved works were done in the 1920s and early '30s. Arntz was born in the small industrial town of Remscheid, near Solingen, into a family dominated by business and factory owners. Although he played with the workers' children while he was a boy, Arntz always knew that his family expected him to remember that as a member of the ruling class he should stay out of the workers' struggle for rights. Prior to the First World War (where he served with the Prussian field artillery), his contact with art involved little more than fleeting visits to exhibitions and lectures. After the war, Arntz entered one of the family businesses, the Eisenfabrik Greb & Co., as a common factory worker. These experiences would inspire his later woodcuts. In 1919, Arntz enrolled in the Düsseldorf Art School and quickly became part of a revolutionary circle of young artists who called themselves Das Junge Rheinland (Young Rheinland). Opposing the conservative instruction at the school, Arntz derived his own knowledge of art from contemporary publications such as Der Sturm, Die Aktion and Die Ziegelbrenner. He decided to concentrate on woodcut and linoleum cuts because he was attracted to the stark contrasts of black and white and these mediums reminded him of certain family photographs that he had repeatedly perused during the war. In 1920, he joined an initially loose group of Communist artists, who later organized and demonstrated against the military and police. He created woodcuts for the Allgemeine Arbeiter Union (General Labor Union) as well as the Communist Intenationale Arbeiter Hilfe. In 1925, he took over Otto Dix's studio in Düsseldorf, and this served to intensify his creative concentration and increase his output. It was only in 1926 that Arntz began to paint, and his work was soon noticed by Otto Neurath, director of the Gesellschafts-und-Wirtschaftsmuseum in Vienna, and the art historian Franz Roh. Throughout his career, Arntz's work consisted of industrial scenes, skewed and sometimes perverse city views, and numerous depictions of workers rebelling against capitalist owners and the police. The individual figures in his woodcuts represented statistics, and the images were often interspersed with graphs and accompanied by articles expounding upon the status of the working class. In 1934, Arntz emigrated to The Hague, where he continued to produce woodcuts and linoleum cuts until the end of his life. During the 1970s, he reissued a number of prints using blocks that he had saved for over fifty years.